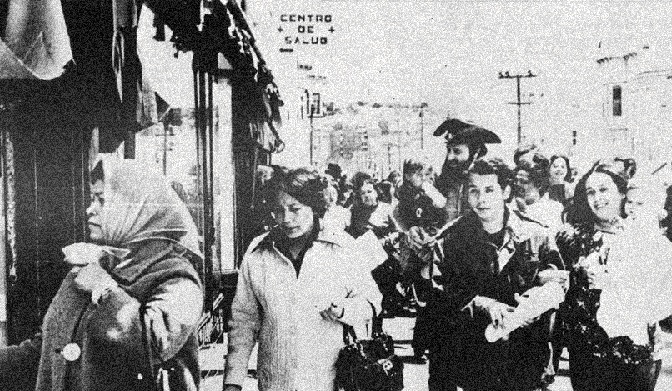 Demonstrating in favor of the Mission People's Clinic/Centro de Salud, spring 1970. Jimmy and Nelli Marquez at right. Our clinic, El Centro de Salud is a health program started by the organization Los Siete de La Raza. It has a long and beautiful history which takes us back to the beginning of the organization. When the organization came together to defend Los Siete, it also came together to defend our people, in all ways, against the deplorable conditions in which our people live. The two years since the organization's birth have been spent studying, learning, and working in our community with our people. In order to understand how to fight our problems, we had first of all to learn about them. You cannot possibly fight an enemy unless you know what you are up against. So we began our long process of work and study and work and study. In the summer of '69 before there ever was a clinic we got involved in series of programs that were to serve as a foundation for the clinic. Our programs started with a free breakfast for children where children could get an adequate meal before going to school. We then started a physical check-up for the children so that we could examine them because we knew that the effects of not being able to eat well or buy medicine would have serious visible results. So the doctors would come by every day for several weeks in order to examine the children. One important thing to keep in mind is that it was not the government who did this, not the public health department; but rather we did, the organization of Los Siete, which grew out of this community to put a stop to the injustices that bind us. This check-up program was extended to peoples' houses. We took the doctors door-to-door to homes so that we could examine the families of these children. So we went door-to-door giving our people the best we could, but still it was terribly inadequate. The knowledge we were able to accumulate made us realize just how big our problem really was. We saw things we never really saw before. We saw children with ear and throat infections, we saw rashes and blisters which they couldn't get rid of. We saw anemic children, tired and listless. We saw mothers and fathers on welfare who could not get adequate health care, because doctors did not want to deal with them. People who had no jobs could not deal with their survival needs, let alone their health care. 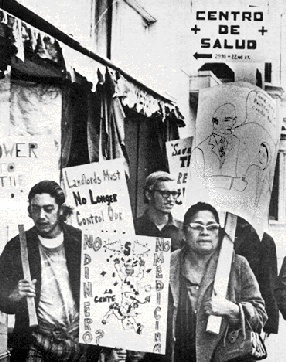 Demonstrating in favor of the Mission People's Clinic/Centro de Salud, spring 1970. We learned of General Hospital and how our people did not like to go there even though they had no other place to go. There were no translators. There was a lot of red tape, social workers who asked personal questions. Why? If we needed health care why did we have to be put through such embarrassment? People who were afraid of immigration were afraid to go there for fear of being reported. So slowly the people opened our eyes. Slowly we began to understand. Just who were these medical institutions made to serve? Were they animal hospitals? Or perhaps for sub-humans? If they were here to serve us, why then did they make medical care seem as though you were applying for a loan? General Hospital is in the middle of the Mission District yet why are there no Spanish-speaking personnel? Or Chinese, Samoan? Why? To understand these questions we have to understand that General Hospital is a training center for young doctors. General Hospital is a training center for U.C. Medical School first and a medical institution second. Training doctors who will go out and make money off of sick people is their first responsibility and caring for sick people is their second job. When we ask why this is so, we hear replies of "there is no money". The government of San Francisco says it hates to misuse the taxpayers money and yet it spends millions of dollars for new equipment to beef up a police department. It spends millions on artificial grass for Candlestick Park (a sports arena). The city is willing to hit the man on the street for millions of dollars so that bankers and their secretaries can get to work faster. It seems that the city administration does not have our people nor any poor people in mind when they decide what happens with this money. Last year the city took an action that created the spark that created our clinic. 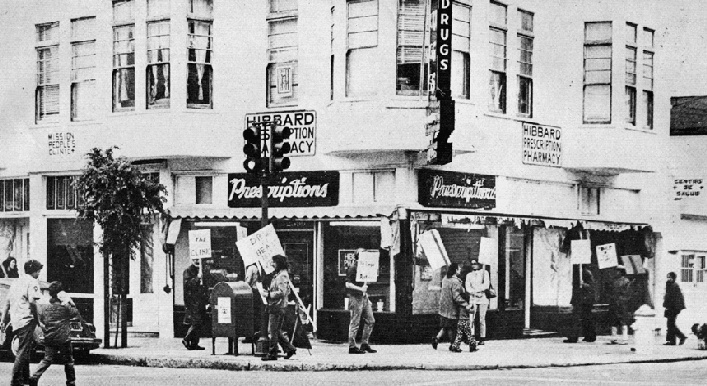 The city allowed General Hospital to close down, leaving people with no place to go, because use they refused to meet the striking hospital workers' honest demands. Their policy was let the people suffer. So there it was, the hospital closed, the people stuck with nowhere to go. We could not allow this to happen. If the city again would not do anything then we would. Within four hours after the hospital closed down, our clinic opened up. This took place in March of 1970. Our clinic has been here for over one year. In that year we have provided service to over 3,500 patients. We have not asked them how much money do you make? Nor what country are you from and do you have residency here? Are you on welfare and how much can you pay? But rather what makes our clinic so beautiful is that this is a place you can go and feel at home. Where the people treat you as people, not as problems. But understand that our clinic is here not because we like to be nice people. Not because we get paid for doing this as a form of charity. Our clinic exists because we understand that the existing facilities are not providing decent health care! That it is not enough to provide just a little charity to help poor people but that good medical care should belong to the people, not as charity, but as our right as human beings. So we are dedicated towards fighting for our people's health, because if there was no real need in our community, then we would not exist. What have we been able to prove? We have seen how the city and the medical institutions do not meet our needs. We have seen how existing facilities are more interested in making money then worrying about the fact that people are suffering and in need of care. Because of their own selfish interests they would let this go on. The question that this makes you ask is: Why, if we live in a democratic society where people all have a voice, do these conditions have to exist? The answer to this question is very simple. We live in a democratic society in name only. You or I have no more say so in this country than the cockroaches in our homes. The institutions are here only to serve a select few. If General Hospital were here to serve us we would come first, not the training of doctors. If it were ours then there would be the necessary translators. If it were ours, then we wouldn't feel as though we were being interrogated. There would be enough staff, enough equipment, enough services to provide us with decent care. The medical industry is second only to the defense industry (tanks, bombs, bullets, etc.). So the medical industry cares little about us, on the contrary it seeks to exploit us. When we are sick or injured, can we go to just any hospital doctor we choose? If we need medicine can we go to the nearest drugstore and order it at any time? Sure we can! Provided we have the money!!! The drug companies spend millions and millions of dollars on advertisement to buy this or that medicine. As always we are the ones who are fooled by these, gimmicks into buying their drugs, drugs which are totally useless. There has not been a new drug discovered in the last ten years. What this means is that the companies simply take an old drug that is not selling well, change it a little in its compound, and sell it as a new miracle drug. The drug industry is one of the most exploitative businesses existing. Yet who is stopping it? Rather than waste money on junk drugs and phony cures why not use that money to make drugs that will benefit people. The answer to this question is the key to the whole story. It is to the advantage of the drug companies to have sick people. There is no money in healthy people. Healthy people need no medicine. If people were healthy they would not need to buy expensive medications and the drug companies would not make money. And their whole purpose is to make money. So maybe it seems a little clearer. The only people who will have a better chance to stay healthy will be those who can afford it. Look at doctors, they reap the benefits off sickness. To understand why we have so much poverty and problems, we have to understand that everything in this country is geared to make money. Take a close look at it. When you hear of all this research being done on heart transplant on polio, on cancer, pay close attention. Who will be able to afford these transplants? Who can afford to have their kidneys transplanted? Who can afford to receive treatment for cancer or polio? Certainly not us!! Why not take that money and use it to stop the malnutrition and all its affiliated diseases? To repair homes which are run down and are breeding places for diseases? To provide access to free medical care needed so badly? So it seems that on one hand we live democratically but on the other we are the ones who will always suffer while a few get rich. So the clinic will exist—as long as there are factories with unsafe working conditions, with doctors and lawyers who work together with the company to cheat the worker. As long as there exist hospitals like S.F.G.H. which are butcher shops, that report our people to immigration when they seek medical care. That use our people's sufferings, to learn off of. As long as the conditions of our homes and communities are such that make the Mission's TB rate three time higher than the rest of the city that gives us an infant mortality rate twice that of the national average. And the list could go on and on. Because any health program, any REAL health program, will look after the people's health right down to the cause, not just the results of the cause. The people that come into the clinic are like a man with a tack in his shoe. His foot hurts so he takes his shoe off and the pain goes away, but then he puts it on and the pain comes back again, because once and for all the tack has to be pulled out. So what good does it do us to give someone some medicine for a persistent throat infection and send him home—a home which has no heat, is dirty, and dark? He'll get it again and again and he'll keep coming back to us for medicine, but he'll never be cured. We exist because there are reasons why our people are sick and are forced to live in these conditions. We know these reasons are the rich ruling circle of this country who profit off not only our sicknesses, but at home and at work—who profit by sending our sons to fight a war in Vietnam so that they can control the lives and lands of other people. Shortly before this publication we successfully defended the clinic against the owner of the building, who wanted us out. We defended it through a defense committee made up of the people who use the clinic. We had struggled only one day when the owner gave up, negotiated, and gave us our new lease. The reason we won was because we had successfully united ourselves and said to the owner, "The clinic is ours and you have no right to take it away, in fact we dare you to try." Because we know that the only time we will be rid of our problems is when we the people have the right to make the decisions that affect our lives, just as with the clinic. Because in the final analysis it is us, the people, who are the key to solving our problems. We have before us the task of removing the tack from our foot.